Named by Surveyor Thomson in 1857 after Tarras Waters, Dumfries, Scotland. Tarras is a thriving agricultural community based on the historic high country sheep stations and new vineyards.Tarras spans the world in its reach with merino wool, award winning pinot noir wines and striking landscapes. 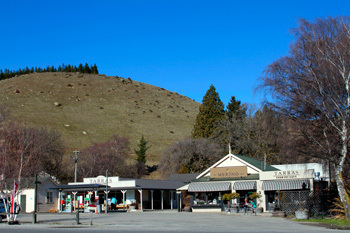 Situated on State Highway 8, Tarras Village is less than 30 minutes drive from both Cromwell and Wanaka. To the north lies the Lindis Pass and Omarama, 83 kilometres away. The vast open space includes a superb vista which takes in the Dunstan Range to the east and the Pisa Range to the west. To the south is a great view looking down the Cromwell Valley, north east to the St Bathan's Range and north west to the mountains and Matukituki Valley. Shared morning tea, all welcome. The CODC have confirmed they will erect a large Toilet sign on the Tarras facility - after July 2019! Situated 400m above sea level it records temperature, windspeed, humidity, rainfall and barometer readings. The broadband cabinet at Bendigo has been upgraded resulting in up to x3 increase in speed. Check with your provider as you may be able to upgrade to VDSL. Spark high speed Wireless Broadband (4G 700) is available in the area. Testing at Bendigo gives 34Mbs download speed compared with ADSL speed of 5Mbs. Use this link to check the coverage at your location. Both Spark and Skinny cell phone services also provide 4G speed. OTHER wireless internet providers include Ultimate Broadband, DFi Wanaka, Farmside, CountryNet. Check the COMMUNITY page for info on clubs and groups in Tarras.